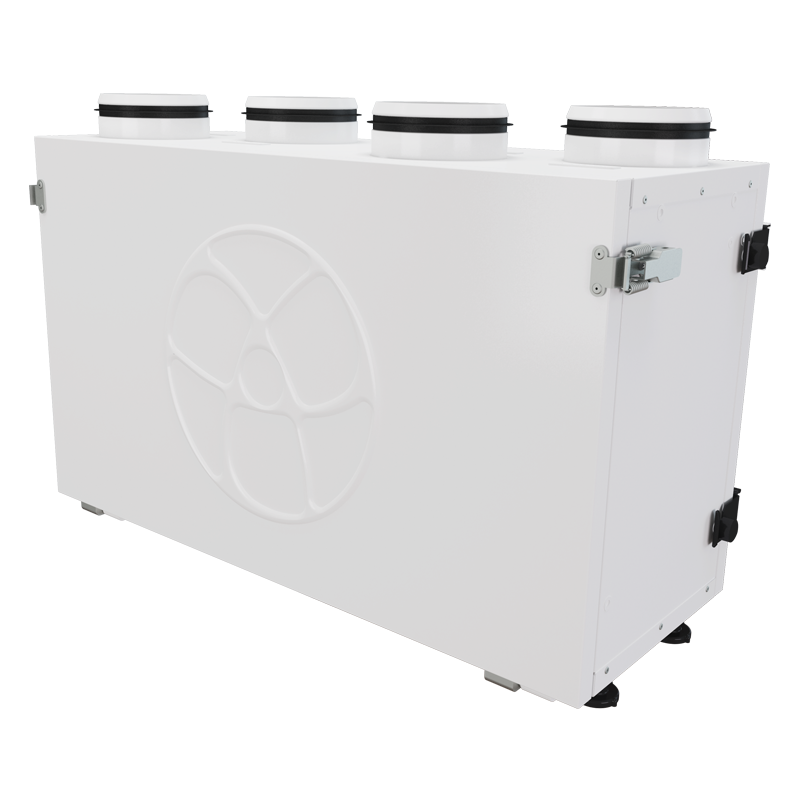 Compact heat recovery air handling units. Maximum air flow up to 300 m³/h. Air handling units for efficient supply and exhaust ventilation in flats, houses, cottages and other buildings.The heat recovery technology is used to minimize ventilation heat losses.Control of air exchange for creating comfortable indoor microclimate. Compatible with round Ø125 mm air ducts. The casing of KOMFORT Ultra EC S2 300 ... white is made of double-skinned white painted metal panels, internally filled with 20 mm, mineral wool layer for heat- and sound-insulation.The spigots are located at the top of the unit and are rubber sealed for airtight connection to the air ducts.The hinged panel of the casing ensures easy access to the unit internals for service works including cleaning, filter replacement, etc. The unit is equipped with high-efficient external rotor EC motors and centrifugal impellers with forward curved blades.EC motors have the best power consumption to air flow ratio and meet the latest demands concerning energy saving and high-efficient ventilation.EC motors are featured with high performance, low noise level and totally controllable speed range.The impellers are dynamically balanced. The KOMFORT Ultra EC S2 300-H ... white unit is equipped with a plate cross-flow polysterene heat exchanger that recovers heat. The drain pan under the heat exchanger block of the KOMFORT Ultra EC S2 300-H ... white is used for condensate collection and drainage. The KOMFORT Ultra EC S2 300-E ... white unit is equipped with a plate enthalpy cross-flow heat exchanger made of polymerized cellulose that recovers heat and humidity. Due to humidity recovery the enthalpy heat exchanger produces no condensate. The air flows are fully separated within the heat exchanger. 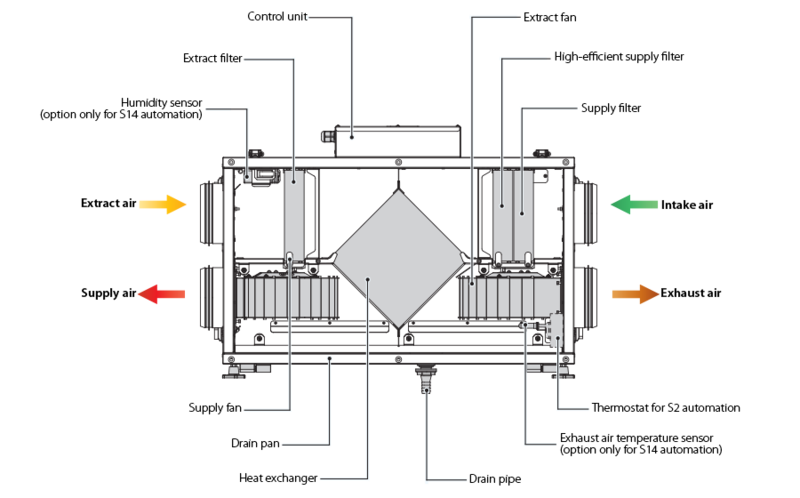 Odours and contaminants contained in the extract air are not transferred to the supply air flow.Heat recovery is based on heat and/or humidity transfer through the plates of the heat exchanger. In the cold season supply air is heated in the heat exchanger by transferring the heat energy of warm and humid extract air to the cold fresh air. Heat recovery minimizes heat losses, which reduces the cost of space heating. In summer the heat exchanger performs reverse and intake air is cooled in the heat exchanger by the cool extract air. This reduces load on air conditioners and saves electricity.When the indoor and outdoor temperature difference is small heat recovery is not reasonable. In this case the heat exchanger can be temporary replaced with a summer block for warm seasons (available separately). FREEZE PROTECTION The electronic freeze protection system is used to prevent the heat exchanger freezing in cold seasons. In case of freezing danger communicated by the temperature sensor the supply fan is stopped to let warm extract air warm up the heat exchanger. After that the supply fan is turned on and the unit reverts to the normal operation mode. The KOMFORT Ultra EC S2 300-H(E) S2 white unit is equipped with the CDT E/0-10 speed controller that is included in the delivery. The KOMFORT Ultra EC S2 300-H(E) S14 white units have an integrated control system with a wall-mounted control panel S14 with a LED indication. Speed selection: Low, Medium or High. Activation of the summer ventilation mode: The supplyfan stops and the extract fan continues its operation with no heat recovery. Fan speed adjustment from 0 to 100 %. Each speed is individually adjusted for the supply and the extract fans. Operation control on feedback from the FS2 duct humidity sensor (to be ordered separately). Unit operation setting according to the external relay (to be ordered separately). Temperature setting for freeze protection system activation. Control and operation adjustment of the filter maintenance timer. External control unit and humidity level control. The units can be fixed to the wall or mounted on the floor using the mounting brackets. The KOMFORT Ultra EC S2 300-E ... white unit is also suitable for ceiling mounting. While mounting provide free access to the service panel for filter replacement and servicing. The KOMFORT Ultra EC S2 300-H ... white unit mounting position must provide condensate collection and drainage.Due to universal casing design both left and right mounting is possible. It requires swapping the service and the back panel. Two built-in G4 and F8 filters provide efficient supply air filtration.The G4 filter is used for extract air filtration.